My tastes had turned to motorcycles...well, actually, what you see here is a boy unsure, unable to pin down exactly what he wants from life. 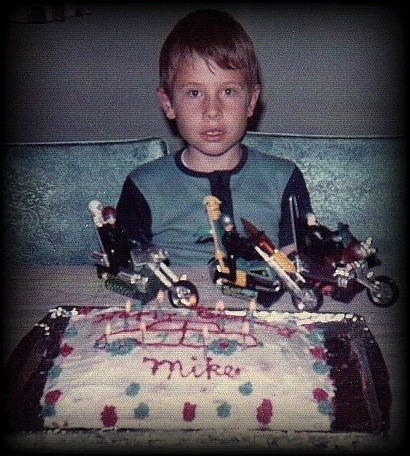 As you can see from the picture on the cake, I liked cars, so why did I ask for toy motorcycles? I couldn't even decide which chair to sit in! My brother Darrel and I were fiercely competitive. He usually won every contest, physical or mental, and had more of a ruthless drive than I did. He was very calculating. I'd be the sneaky one to come back later and exact my revenge on him in silence, in the shadows...a terrorist ninja type. I'm sure you have one living in your neighborhood...after all, my hero was Batman. To this day I am fascinated with that character. I was evil but no one outside of the family knew it. At school and everywhere else I was a sweet little boy...very shy and very quiet. Inside I was Satan...wanting blood. But I loved Brighteyes my cat, more than anything in the world. More than anyone in the family I loved this cat. And since my parents didn't believe in keeping him inside or giving him vaccinations I used to worry myself to death that he would be killed or catch rabies and die. Of course my parents would say,"He's just a cat". He was more than a cat to me. My feelings were very parental...I wanted to protect him. I used to do tornado drills to see how quickly I could run outside, grab him, and take him to our basement. The midwest was notorious for tornadoes and I was terrified of them, losing many hours of sleep at night praying for them to leave. 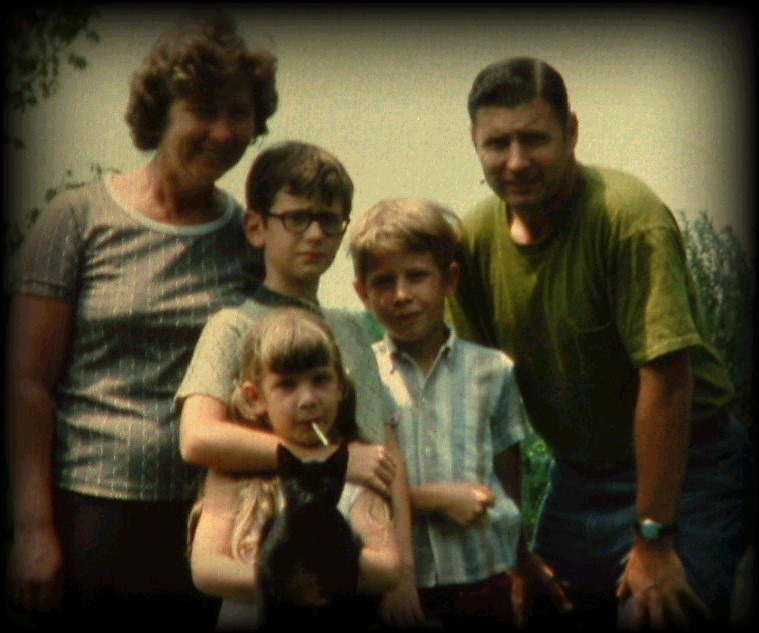 Viola (Mommy-age 45), Darrel (age 10), Brenda (age 4...smoker), Brighteyes the Cat (age 2-months), Michael (age 9), Richard (Daddy-age 44). As a child I hated my sister, Brenda. I don't know exactly why but I think it was something to do with jealousy. My parents told me I was jealous but I didn't even know what that meant despite my talent with languages. This summer we began a series of summer family trips. I met them with mixed feelings. Although I absolutely loved to travel, still do, and looked forward to these trips all year long, I soon found that spending more than a week elbow-to-elbow, nose-to-nose with my family...in a car, in a motel (sharing bed with brother and sometimes sister too), herded around parks and sights wore me out! In 1975 we visited Disneyworld in Florida, along with Cape Kennedy and surrounding sights. Next year it was Denver, to see my uncle Ben and Aunty Irma. Then Washington, D.C., Florida three more times, Denver two or three more times, Niagara Falls, Toronto Canada. It was great, but tiring, and I learned so much about traveling, navigating, driving in heavy traffic, and Darrel became a back-seat navigator. I kept logs of the events as they played out. Dad did the bulk of the work, driving the whole time, getting the car ready, and doing some of the packing. Mom did most of the packing.